For the followers and practitioners of the various faiths of the world many of the words and stories contained in their scriptures may often appear to be only stories of ancient times of mysticism and sorcery. For the Ahmadiyyat Muslim Community our beloved Holy Quran contains words more modern and up to date than the evening news on our favorite local channel. The above verse is a constant reminder of the daily life being lived by many of our brothers and sisters in countries around the globe. This life giving blessing called the Holy Quran is a never ending treasure of knowledge and guidance and just as it has guided the Muslims who were blessed to walk in the shadow of the Seal of all the prophets, our Master Muhammad Mustafa (saw), so today it continues to offer the life-giving knowledge to those who pray to be included with the Muslims talked about by not only Muhammad (saw) but whose mention was stated, by Allah Himself, who would come in the Latter Days. These Muslims would come under the banner of the Promised Messiah and Mahdi (as) whose purpose and mission would be to raise the flag of Islam over all worldly and idolatrous beliefs. 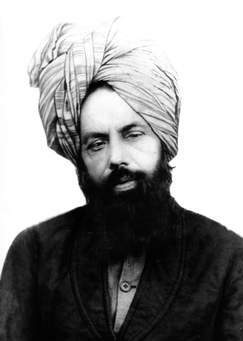 Today we stand with pride under the banner of the Messiah of the Latter Days, Hazrat Mirza Ghulam Ahmad of Qadian (as) in hopes that Allah, the All Knowing, will grant us the privilege and honor of being able to fulfill our duties and to meet the requirements to be labeled and remembered as the true followers of our beloved Master Muhammad Mustafa (saw) in these modern times. the connection between Allah and this humble Unlettered One (saw) would be a connection that neither man nor time itself would ever be able to break. A bond that was so intense that even when the all other bonds of guidance between all the other faith leaders of the world would be cut short the bond between the Creator of All the Worlds and this Orphaned One(saw) would never be cut asunder and that the All Mighty Himself would protect his holy name and bring one into this world whose divinely guided hand would once again raise the name of Muhammad(saw) with such fervor, love, and dedication never to be seen in human history and never to be witnessed again. This was done with completeness by a Messiah (as) so engrossed in the love of Allah and the love of his Master Muhammad (saw) that he said that Allah, the All Powerful, told him that if he would have asked he would have split the moon in two. The first statement made by Allah, the All Knowing, is, “I am about to place a vicegerent in the earth,”. The beauty of this simple statement is as timeless as it is easy to understand. As Ahmadi Muslims we accept all the Prophets as believers in the One True God and as men who because of their deep love and devotion to proclaiming the Oneness of the All Mighty and their immense sense of caring and brotherhood for mankind culminating in the coming of the Holy Prophet (saw) whose closeness and bond with the All Mighty encased the container of Prophethood till the end of time. As Muslims we recognize all the great heroes of mankind who selfishly lived their lives in praise of the Glory of God and whose every thought was encompassed with guiding man to reach the glorious heights of spiritual ascension given to us by the All Mighty. This verse also proves that only the One True God can place and protect a prophet and that all false prophets would only be welcomed by rejection and embarrassment. So this verse not only states the coming of one Messenger but can be easily applied to every Prophet sent by the One True God since the dawn of the spiritual revolution beginning with Prophet Adam (as). On the flip side of the verse the second statement by the All Knowing refers to the angels saying,” Wilt Thou place therein such as will cause disorder in it, and shed blood?”. The angels having witnessed the lower moral character of mankind since the creation of our species continue to wonder as to why God would raise such an institution that would cause conflict, torment, and loss of life. Having witnessed the struggle within man as whether to accept high moral character or to accept and devout one’s self to the worldly lower qualities that reside in our natural selves the angels inquired time and time again why Allah, the All Knowing, would continue to bring a vicegerent into a world of men, who acted more like animals, to bring them back to the right path when it would only cause the spilling of blood and the loss of life, property, and honor. Just as the first statement has proved it unending truth surpassing the erosion of time and travel so the second statement also stands the test of time and social barriers. As Ahmadi Muslims our education and study of all the Prophets leads us to understand, affirm, and validate the truth of this most simple yet glorious phrase of our beloved book of Guidance. Every Prophet was met with persecution, torment, and malice. of the Highest of the high, to help guide the lowest of the low. The noble lovers of God and their physically weak companions suffered the most horrible of pains only to attain the greatest of spiritual pleasures and closeness to the warmth and blessings of the All Mighty. This is the story of all the believers since the beginning of time. This is the beauty, blessing, and wisdom of Allah, the All Knowing, being displayed in this one timeless jewel of the All Knowing. In this verse the All Knowing ensures mankind that He will never abandon mankind to drown in the pool of idolatry and false beliefs and that He will forever bless mankind with the beautiful garment of spiritual thread that will clothes us in the beauty of morality and love for our fellow man and woman. Allah, the All Knowing, blesses us with the knowledge that His guidance and protection will always be there to shield us from the forces of Satan and safeguard us from the trickery and lies of the Deceiver. What could be a greater blessing than a security system that knows no sleep or slumber? Finally the wisdom of the All Knowing is shown so brightly by putting both of these simple statements together in the same verse to show mankind that both Prophethood and persecution will forever go hand in hand and that by accepting one man has no choice but to accept the other. By choosing to eat peanuts we have no choice to accept the salty aftertaste it leaves in the mouth. By eating candy we must accept the sweet flavor brought on by the ingredient of sugar. This is the unbreakable bond that God has given mankind when he or she chooses to accept the “vicegerent” of the time. As Ahmadi Muslims this truth not only exists in the words of Allah’s revelation but exist every day in our lives. This is not a burden placed upon us by God or a cross placed on our shoulders by man it is a realistic undeniable proven fulfillment of God’s eternal promise to those who choose to accept His Truth and the truth of His Prophet. To Ahmadis the promise that has been placed on our shoulders is a blessed fulfillment of the promise of the All Mighty of His beauty, His blessing, and His wisdom. The Holy Prophet (saw) when mentioning the true believers of the Latter Days stated that they would be like me (saw) and my companions. Although our persecution is nothing compared to the extreme cruelties placed at the feet of the Seal of the Prophets (saw) and his noble companions the acts of anger, torment, and senseless killing of innocent Ahmadis only proves the truth of Muhammad Mustafa (saw) and his humble servant, the appointed vicegerent of these modern times, Ghulam Ahmad (as). This same cup of persecution that was drunk from without the slightest of hesitation by the early companions now rest at the table of the companions of the second Isa and from it we drink till our thirst is quenched. With no hesitation our sisters and brothers dine at the table of the greatest of companions who without the slightest hesitance accept the call of the Messenger ready to offer their lives and the lives of their children all for the love of Muhammad (saw). Oh what a holy and blessed table to dine! Oh what tears of jealousy roll down my face of these brave companions of the Messiah(as) who proudly accept the cross of the Messiah(as) and everyday continue to envelope themselves in the robe of Khilafat under the shield of the Messiah of our time(as). The burden better yet the blessing that they are offered is a living symbol of the truth of the Messiah (as) in that like the companions of our Master Muhammad Mustafa (saw) these humble yet honorable followers of Imam Mhadi (as) continue to smile in the face of a physical death and physical pain in knowing that at any moment whether day or night they are only mere steps away from being called to join the early companions around the campfire of the Seal of the Prophets (saw). This is the true meaning of Islam for these believers have given up just as willingly as the early companions their life, time, property, and honor strictly for the cause of Allah and His Messenger. This blessing that Allah has placed on the Ahmadis across the globe continues to prove true after almost fifty years of torment in multiple countries across the globe that like the glorious words of the Quran. By having true belief in the words of Allah true righteousness knows now barriers of time or social confinement. As long as one is firm in his belief in the All Mighty and is steadfast to his obedience to the Khilafat of the time the angels will stand in defense of the believers. Once again the words of the All Mighty have come true before our eyes and once again His truthfulness has been displayed for the world to witness once again. This common bond of persecution unites us today with the prophets of the past and and their blessed companions but there is no greater honor in this world or the next than to be counted as the true companions of the Seal of the Prophets, Muhammad of Arabia (saw). This is our greatest joy which we will continue to hold onto with righteousness, patience, and fortitude so that when we stand before the All Mighty we will be able to raise our flag high and be counted among those whom Allah had told His greatest love (saw) would come in the Latter Days. May we forever continue to uphold the blessed name of Muhammad (saw), his mirror image Mirza Ghulam Ahmad of Qadian (as), love and obey Khilafat, and remember, honor, and cherish the names and memories of those who have willingly given their last breath for the sake of Islam and the remembrance of the One True God, past, present, and future! Insha Allah! Insha Allah! Insha Allah!